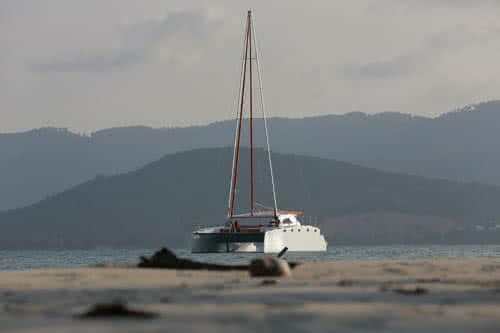 The Sensation is a 42ft (12,5m) sailing catamaran. If you are not a sailing expert, you might not care too much about the technical gimmicks but rather enjoy enormous lounge area which offers shaded space for up to 25 persons. Even though you are fully protected by a roof you can enjoy the breeze flowing through as all saloon windows are removable. Registered for 25pax, shaded seating is available for 20 people! This is the only boat in Thailand with an A-Mast. With an A-Frame Mast, roller furling sails can be used and these sails are deployed and rolled up in seconds. This increases sailing time and also improves safety over conventional masts. Reviews for "Sailing catamaran “Sensation”"